I wish I had the text to our priest’s homily this weekend. First of all because with the little kids I always manage to miss a little bit of it, but also because what I did hear clearly, I would love to share it word for word with you. So I will share what I think was the most important part, or at least the part that struck me as the most important part. 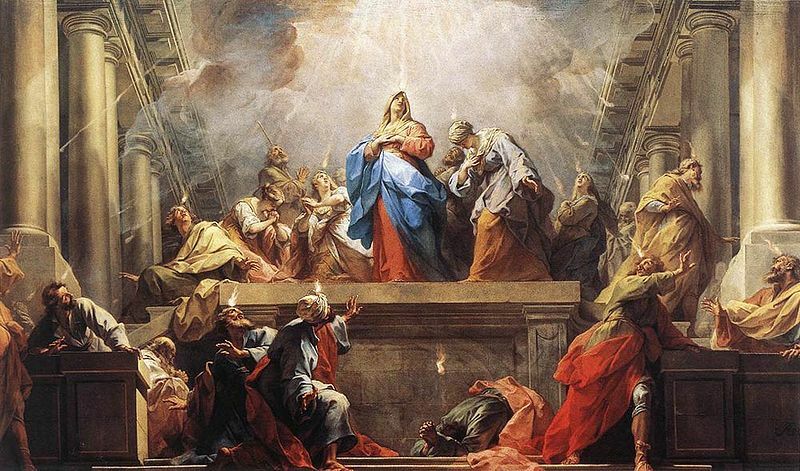 We celebrate Christmas and Easter as the coming and the returning of the second person in the three persons in God, but we don’t normally remember that Pentecost is the celebration of the coming of the Holy Spirit, who is after all the third person in God. And yet there is no huge celebration with a tree, or baskets full of chocolate eggs to find. Part of it I am sure is that the Holy spirit, unlike Christ, has no physical manifestation that we can understand. Yes, I realize the irony in what I just said. The Holy Spirit has not physical manifestation. But, the truth is, that we as humans have a hard time getting our minds around something that we can’t see or touch. Think about St. Thomas, who did not believe that Christ had risen until he could see Him. A slightly different thing but the same point. He could not see Him, therefore he could not believe. The other part of it, I think, is that the Holy Spirit, unlike Christ, is still with us in a very real sense. When Christ ascended to Heaven, or really before he did, the Holy Spirit came to the apostles, and the Holy Spirit remains with us today. Like other things in our life, when they are there every day, we marginalize them or even forget about them being there. We forget to celebrate the wonder that they are. The same thing can happen with us and the Holy Spirit. We forget It is there. We forget to ask It for help, and we stop being able to feel like It is part of our lives. We don’t celebrate It the way that we should. I know at least, I have forgotten to do this. This is something I hope to be able to fix now that I had a chance to think about it. Thank you Father M. N. for point it out to me, and giving me this to think about.